I was reading a story the other day related to primate enrichment at the National Zoo in South Africa. Their goal was to create an enrichment program for their baboons in an effort to increase activity and decrease aggression within the group. The group consisted of 1 male and 3 females. To deal with the aggression they gave contraceptives to the females which definitely helped with the aggression but they felt they could do more to enrich the lives of these baboons. This article will show you some very inexpensive ways to enrich the lives of primates kept in captivity. The zoo added some furniture to the exhibit: hammocks made out of fire hose, feeding tables, wood stumps with hiding places, and an area of wood chips to explore. Items were added and exchange daily to keep the group interested in the activities. To further prevent boredom, they started to provide whole food instead of chopped, they also started to wrap food in newspaper, putting food in pinecones, and they were hiding/placing the food in new areas of their exhibit. By placing and hiding the food in new areas of their exhibit, they were able to increase the overall activity within the group. Searching for food seemed to create a lot of excitement and competition within the group and caused the baboons not only to be more active during the day but it also resulted in less aggression within the group. 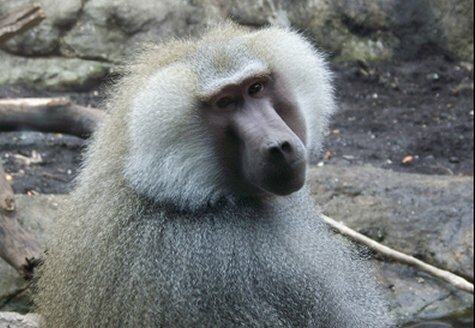 By providing whole food instead of chopped, the activity within the group also increased since the baboons were handling the food more. Before eating it, they would sniff it, play with it, carry it around and hide it from the other members within the group. The wood chip area was clearly the all time favorite of the entire group. It created the most activity and interactions even days after the activity was introduced. The group would continue to check the wood chip area for food even though different activities were introduced for that day. This program shows that introducing some easy, cheap and non-time consuming enrichment changes can truly make a difference in the live of a primate.